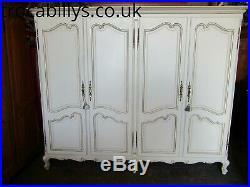 New into our depot and dating from the mid 20th century, This is a very pretty French armoire. 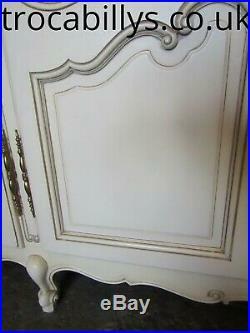 It's in the Louis style typical of French mid century furniture and has a touch of Hollywood regency. It has some very beautiful carved and polychrome painted features. 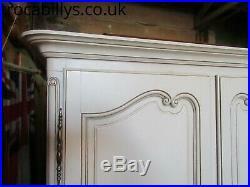 It stands on pretty cabriole legs and has nicely shaped, panelled doors typical of the Louis XV style... 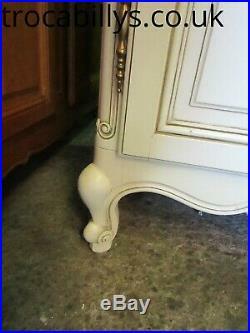 This type of French vintage furniture breaks down easily to accomodate tight access and bolts back solidly together when in place with steel bolts.. it's a traditional French method of furniture construction which became popular over the last 2 centuries as apartment dwelling became more frequent in French citys. [The center section with the drawers does not break down so enough acess will be needed to accomodate this piece]..
Dimensions-It's 191cms high x 53cms deep[hanging depth] x 307 cms wide. 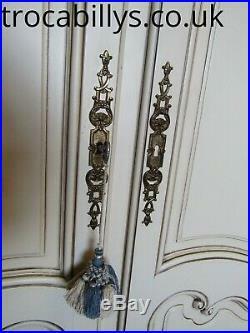 [at cornice overhang]It has long hanging rails in the left and right hand 108 cms sections. 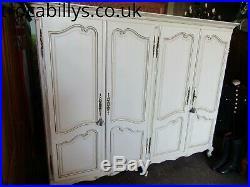 This is going to look stunning in a French inspired room and give you loads and loads of practical storage.. We can deliver [mainland England] and assemble. If you live at a greater distance then please let me quote you a price from us or our trusted couriers. 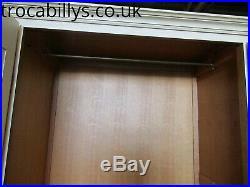 Please note customers in Scotland will have to self assemble the armoire as our long distance couriers don't provide an assembly service. Parts will be colour coded and full instructions emailed. 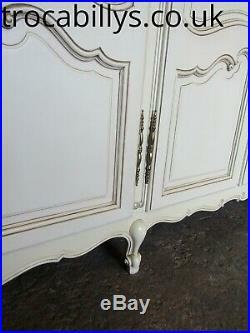 Please take a look in our shop where you will find more beautiful French furniture. We import monthly so our stock is ever changing so you'll always find something new to see. 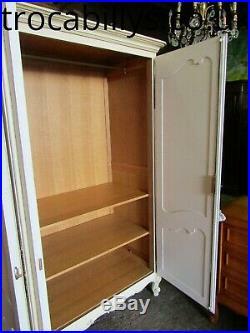 We are a 25 year established family business with a wealth of experience in importing French furniture. 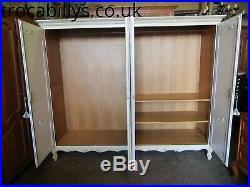 Whenever possible we prefer to deliver our armoires personaly and install them into our clients homes. 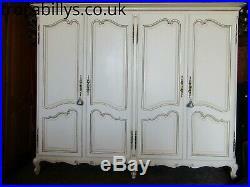 The item "Vintage 4 door French original white painted Louis armoire wardrobe. Flat packs" is in sale since Friday, February 22, 2019. 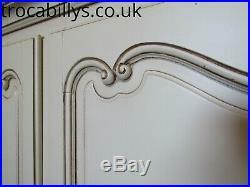 Width: 232 cms including cornice overhang.